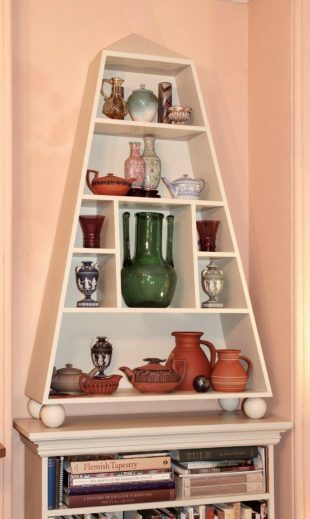 Nick has made a pyramid cabinet for Derek Adlam to display some of his collection of curiosities. Derek was for many years active in the neighbouring workshop making harpsichords, clavichords and early pianos. The Egyptian-style teapot on the bottom shelf was restored by Fiona Hutchinson, a ceramics restorer in a neighbouring workshop at Welbeck, including a new alligator handle which had gone missing.